The primarily tourist-based economy in Blaine County will likely take a hit from the federal government shutdown, which took effect on Tuesday. Rehabilitation efforts following the Beaver Creek Fire will also be stalled as a result. About 800,000 “non-essential” U.S. federal government workers are on indefinite leave, resulting in closures of 401 national parks and monuments, museums and many other federal agencies. The federal government shutdown, which resulted from a congressional dispute over whether to fund the Affordable Care Act health-care law, is affecting more than 100 federal employees in Blaine County. The shutdown will not affect U.S. post offices or air-traffic-control-tower operations at Friedman Memorial Airport in Hailey. However, the shutdown is hampering recovery efforts from the Beaver Creek Fire, and limiting search-and-rescue operations for a missing woman at Craters of the Moon National Monument and Preserve near Carey. “Hopefully, this won’t last too long,” said U.S. Forest Service Ketchum District Ranger Kurt Nelson. He said at least 100 Forest Service and Sawtooth National Recreation Area employees were sent home due to the shutdown and that numerous campgrounds and trailhead bathrooms within the SNRA are closed until further notice. Nelson also said a Burned Area Emergency Response team request for federal funding to carry out aerial mulching on about 1,500 acres of highly-erodible land burned by the Beaver Creek Fire last month (and aerial seeding to replant grass on about 12,000 acres) was not processed before the shutdown began. The mulching and re-seeding efforts were planned to begin in late fall. Nelson would not speculate on whether the project would begin on time. Nelson said the few remaining employees in his district were busy Tuesday bringing in heavy equipment from the field and completing close-down operations. “We are closing all services other than emergency and law enforcement,” he said. Craters of the Moon National Monument and Preserve spokesman Ted Stout said Tuesday morning that 16 of the monument’s 19 employees received furlough notices Tuesday. He said three more will remain on to keep the area facilities running until the monument closes for winter. Stout said Tuesday was the first day his staff had suspended efforts to locate Jo Elliot-Blakeslee, 63, who was reported missing on Sept. 23. The Ketchum Ranger District office in Sun Valley will not be open to sell firewood-cutting permits. Permits can be purchased instead at the Camas Creek Store at 113 Highway 20 in Fairfield. The Small Business Administration Office Disaster Loan Outreach Center at Hailey City Hall will remain open as scheduled until Thursday, Oct. 10, providing loan assistance to businesses and other organizations impacted by the Beaver Creek Fire. 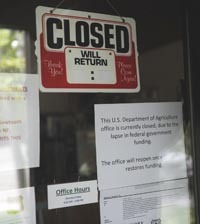 “We will remain open due to the fact that disaster assistance is considered an essential service,” said SBA spokesman Burle Kelton. Since 1976, there have been 17 different federal government shutdowns. The longest came in 1995 and 1996 and lasted 21 days.